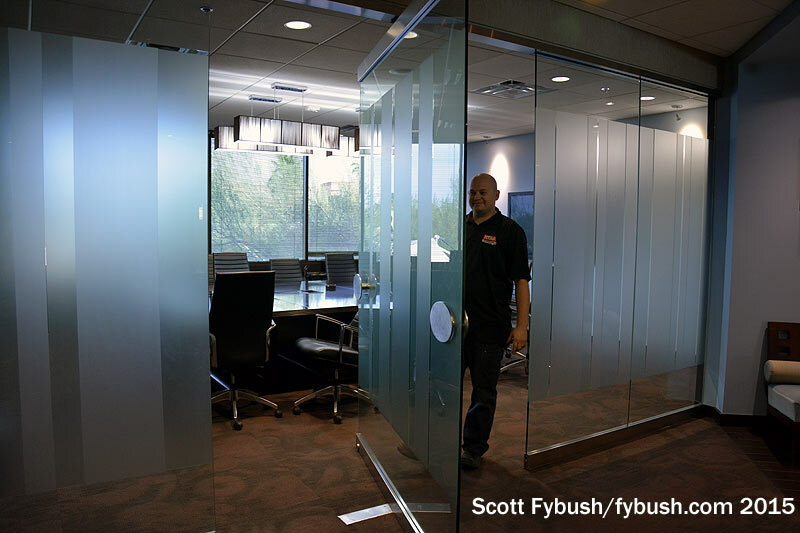 In a market like Phoenix, a lot can change in a few years. When our plane touched down at Sky Harbor Airport in April 2015 on the way to the NAB Show (the long way! ), it had been six years since we’d last been in the Valley of the Sun, and we had some catching up to do. Best conference room door ever? 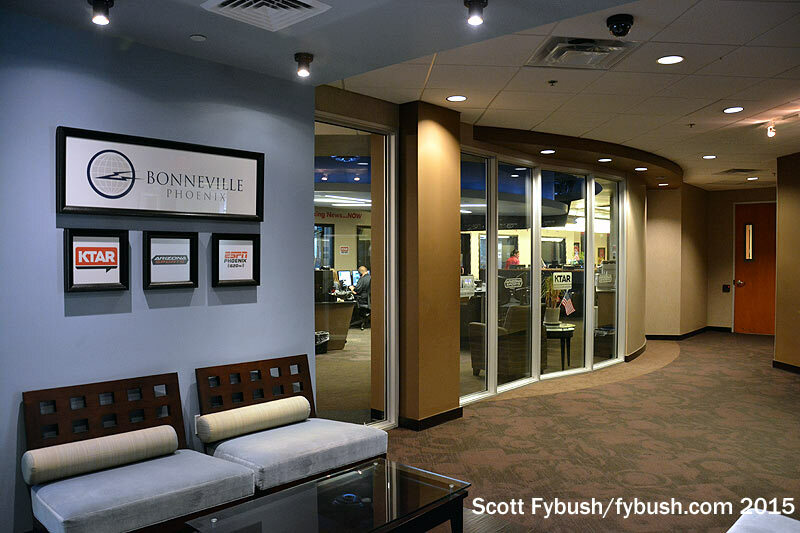 First on the list was the Bonneville cluster, which had been getting ready for a move when we last visited in 2009. 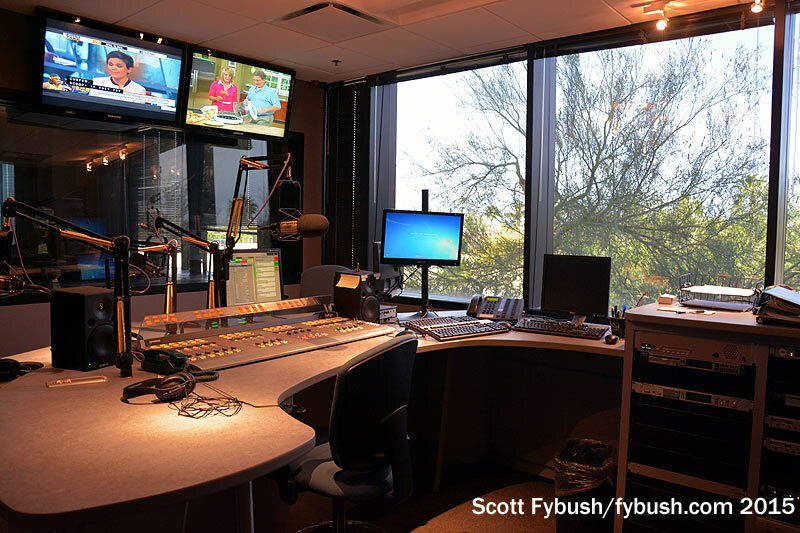 Back then, the cluster consisted of sports KTAR (620), news-talk KTAR-FM (92.3) and adult hits “Peak” KPKX (98.7), all housed in a somewhat cramped two-story building at 5300 N. Central Avenue. 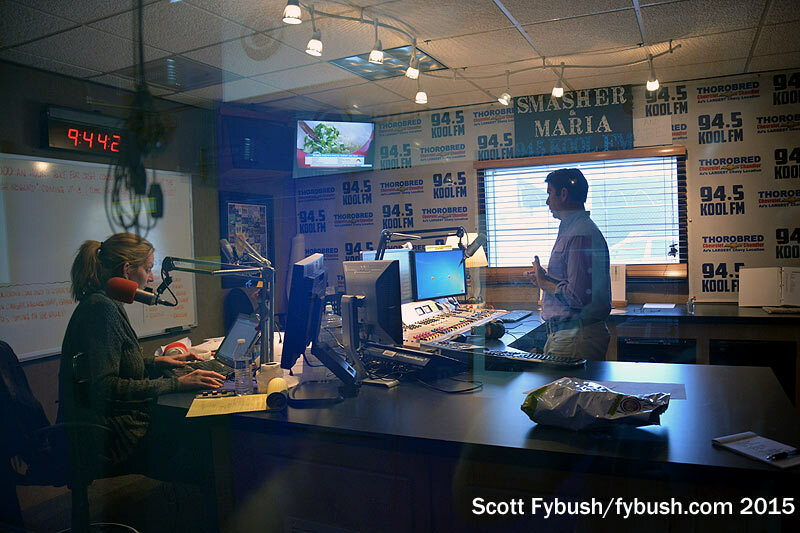 Less than a year later, the stations moved north and a bit east to the second floor of an office park at the north end of N. 16th Street, and not long after that Bonneville again shuffled the deck, flattening “The Peak” and moving the local sports talk from 620 to what’s now KMVP-FM on 98.7, turning 620 into a full-time ESPN Radio feed with some overflow play-by-play content. 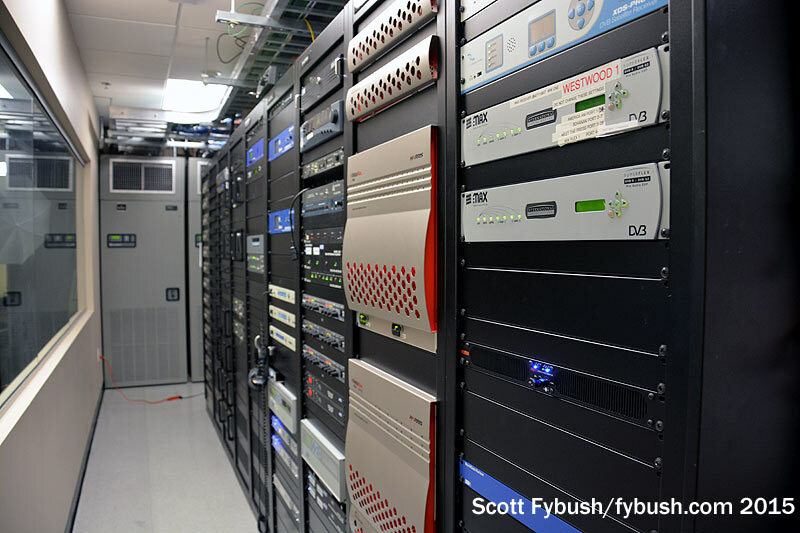 When the Peak was here, its studio was down a separate corridor to the left in an area that’s now used for production and for controlling 620 when it’s in overflow mode. 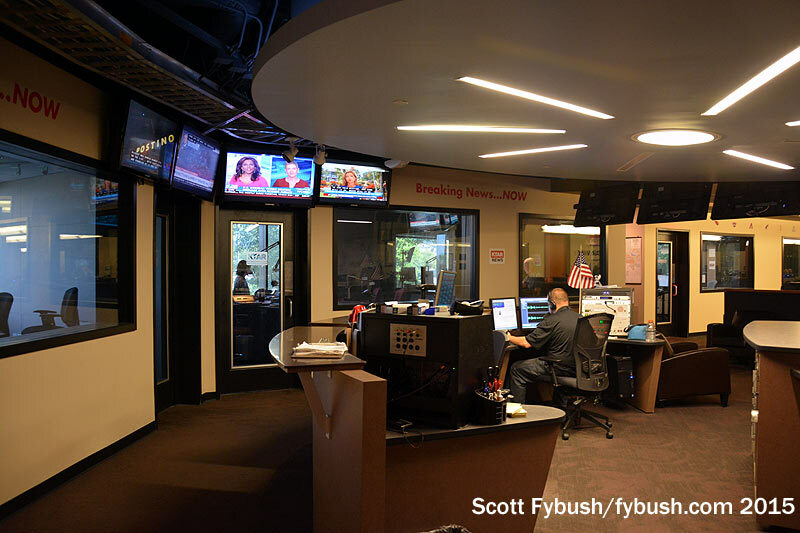 The KTAR News area includes a mirror-image pair of control and on-air studios with a nice view out to the newsroom; the newsroom, in turn, extends down into a sports bullpen that’s adjacent to a similar pair of studios for 98.7. 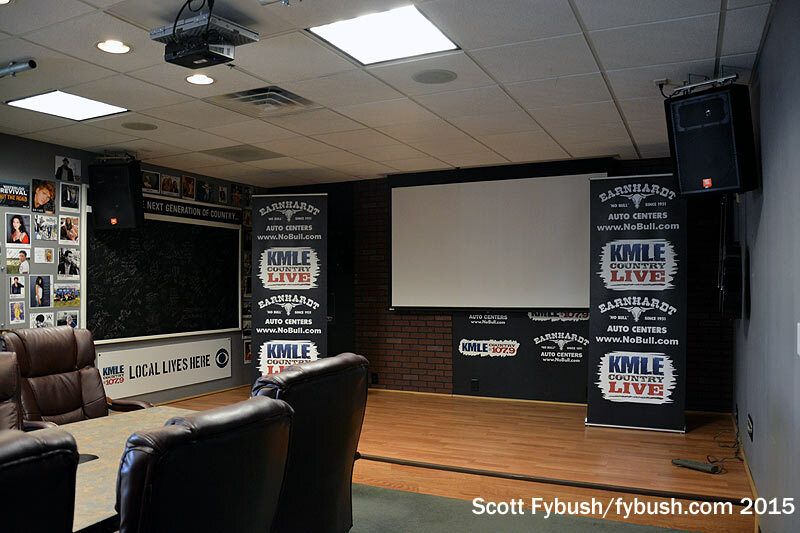 Bonneville gets the multimedia world in a way some other broadcasters don’t: this facility was planned from the start to do video and digital. 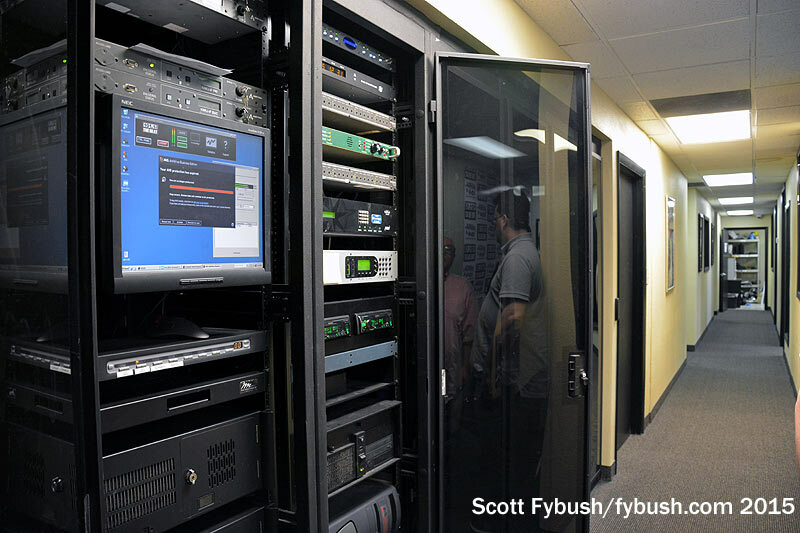 Down at the far end of the newsroom, next to the window into the rack room, there’s a green screen studio and video production suite that feeds the news and sports websites and apps. 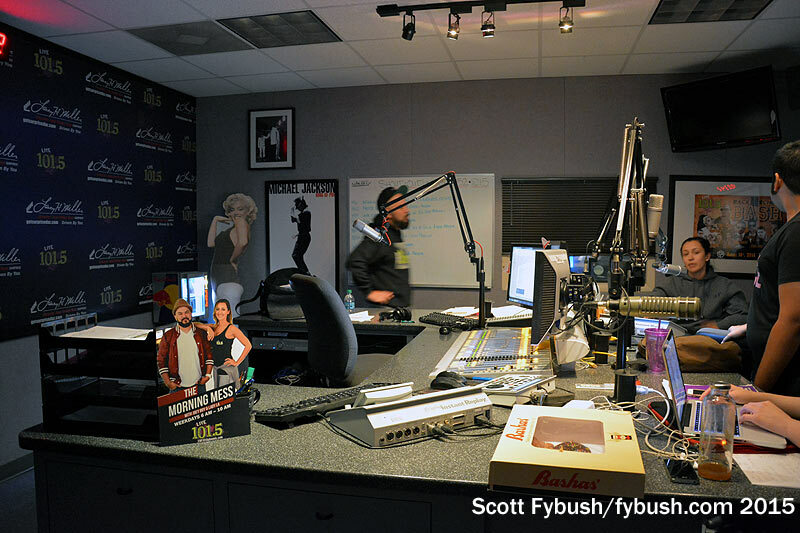 If Bonneville is the epitome of modern, the CBS Radio studios just north of downtown at 840 N. Central are as classic as it gets. 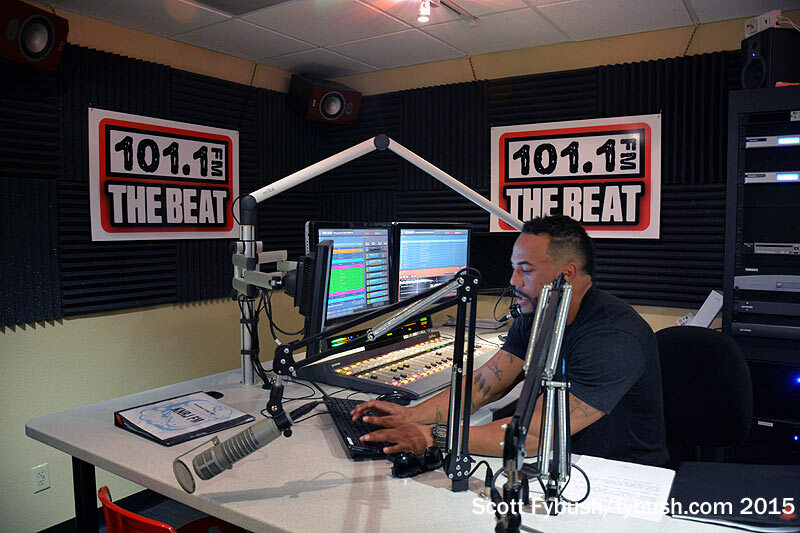 This is the longest-running radio address in Phoenix, dating back to the 1940s when it was built as the home of KOY (550), and it’s been home to radio stations ever since. 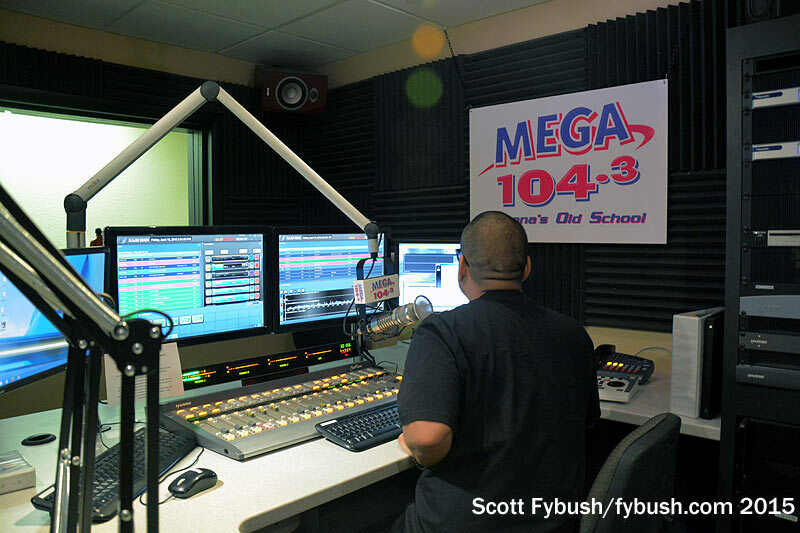 The consolidations of the 1990s brought KOOL-FM (94.5), KZON (101.5) and KMLE (107.9) into what was then the Chancellor Media family, joining KOY/KYOT here at 840 N. Central. 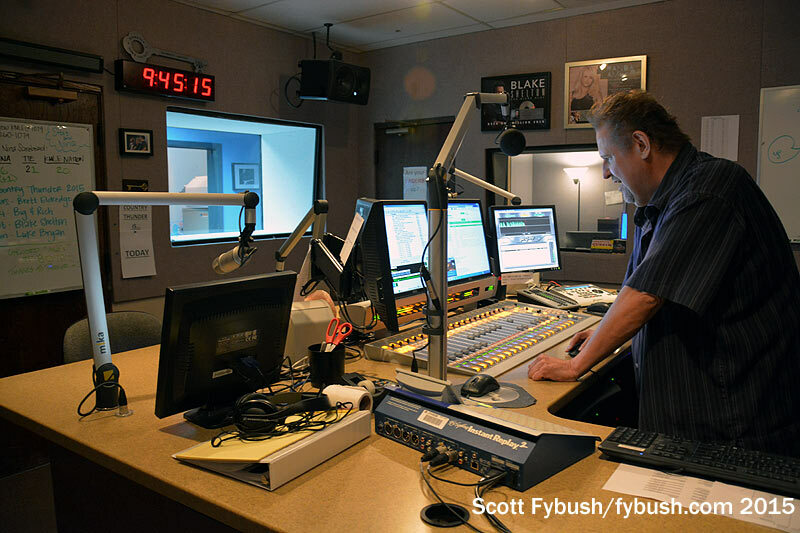 When Chancellor merged in with Clear Channel, which already had stations in the market, KOOL, KZON and KMLE went to Infinity and thus to present-day CBS Radio, which is why the old “KOY Building” no longer has a KOY in it. This is a neat building, with several generations of history accreted along its hallways. A 1970s renovation turned what had been an Art Deco building into Southwest adobe and tile. 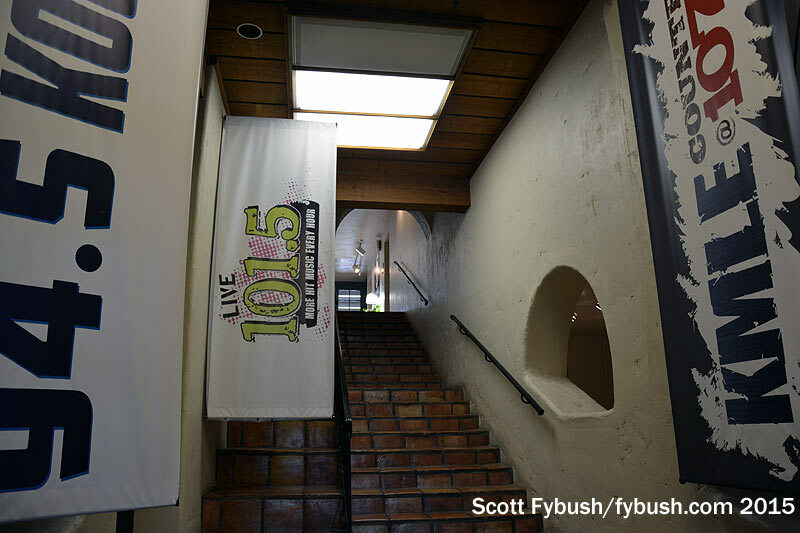 Walk into the lobby now (where there’s a nifty little workstation that allows visitors to record station IDs), and you’ll be facing a steep tiled stairway that leads up to management offices upstairs. 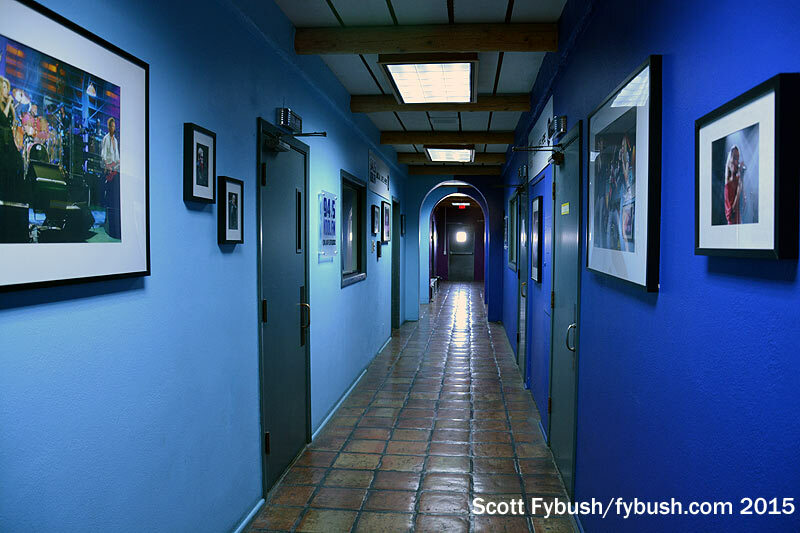 There are programming offices along the north side of the building, and behind them a very blue tiled hallway lined with studios that date back to the 1970s. 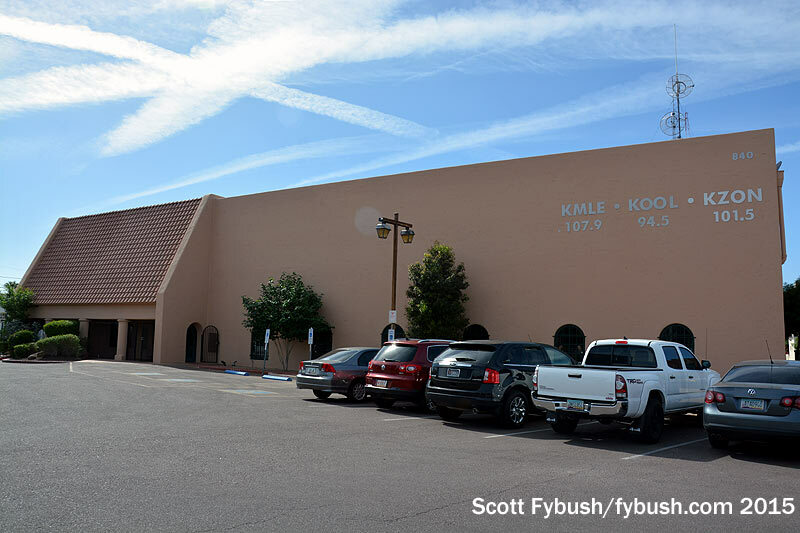 KOOL-FM and a crowded rack room are on one side, across from the old KOY studios, now used by country KMLE and a production suite. Top-40 KZON is at the end of the hall in a space that was rebuilt relatively recently. 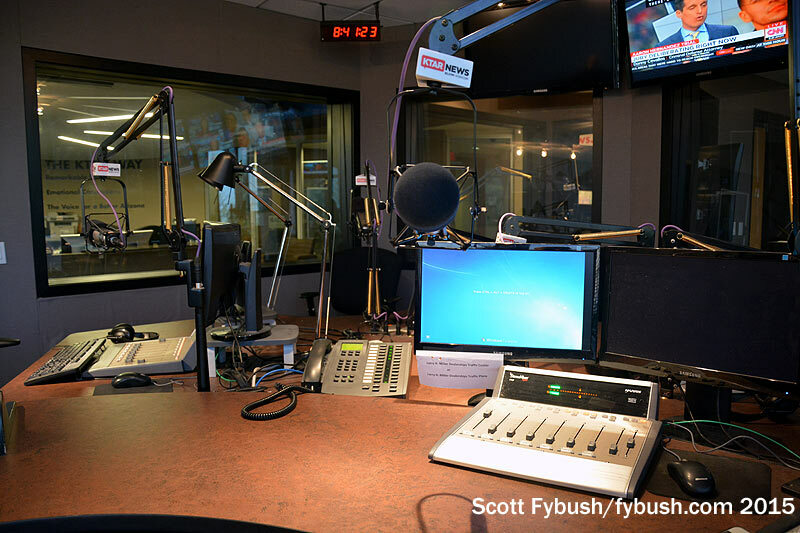 There’s a big main air studio that looks into a DJ booth – and look carefully at those speakers, where the wires that hold them from the ceiling also carry the audio, in a nice clean setup. 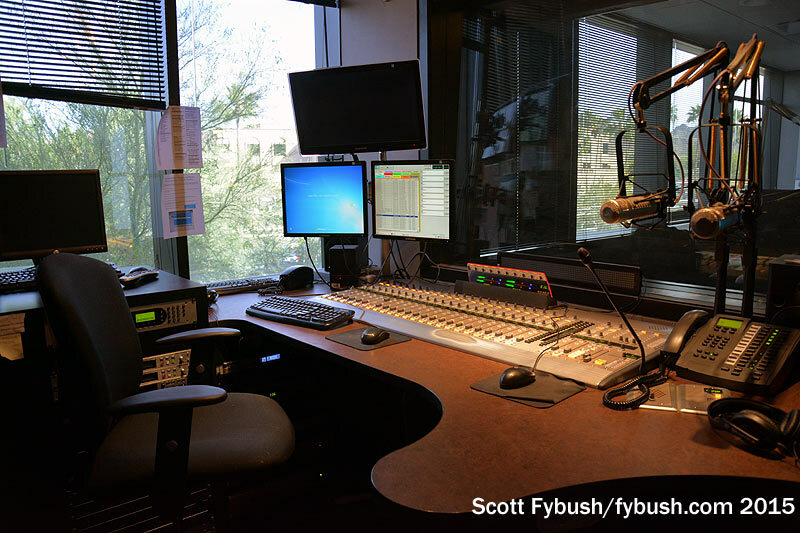 One more studio stop wraps up our day in Phoenix: Sierra H Broadcasting is on the second floor of an office building at Indian School Road and the 51 Freeway, and it’s here that we find a pair of stations that are more recent move-ins to the market. KNRJ (101.1 Cordes Lakes) and KAJM (104.3 Camp Verde) both moved south from the mountains around Payson. 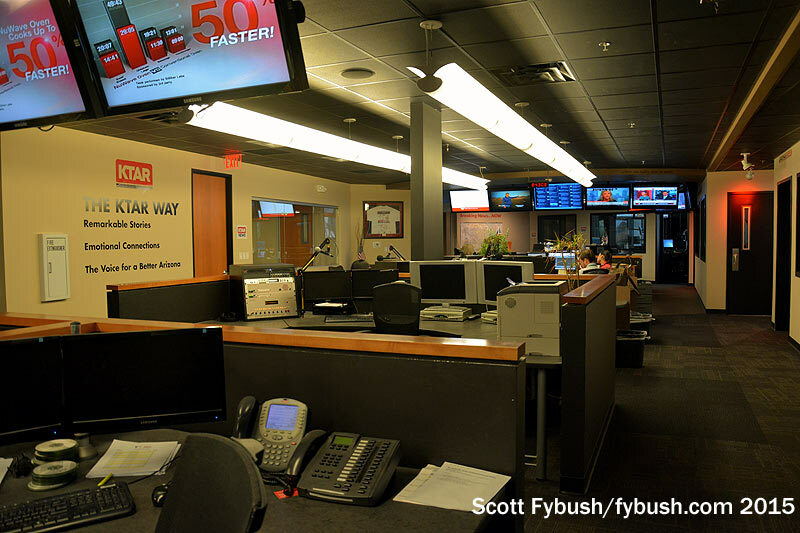 Today they target Phoenix’s urban audience from mirror-image studios that are just a few years old. 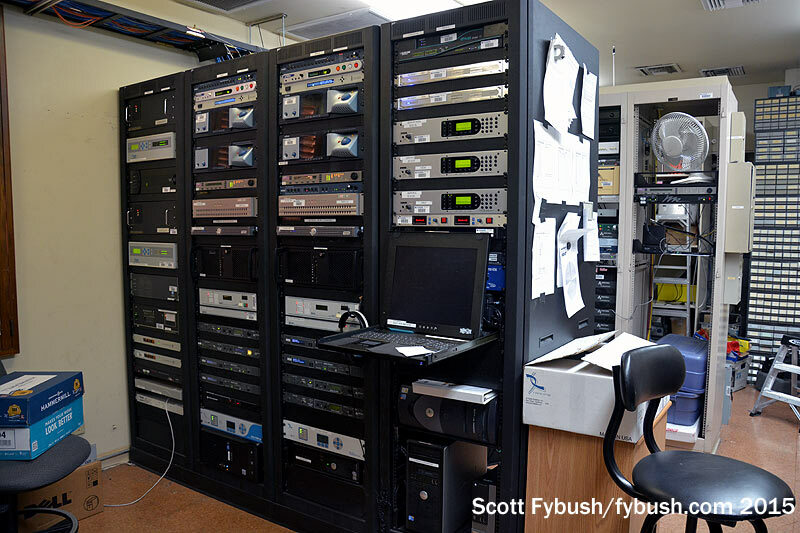 While KNRJ and KAJM throw their signals way back up north to serve the valley, everyone else we’ve seen today transmits from the majestic South Mountain tower farm – and it’s that site we’ll head to in next week’s installment! 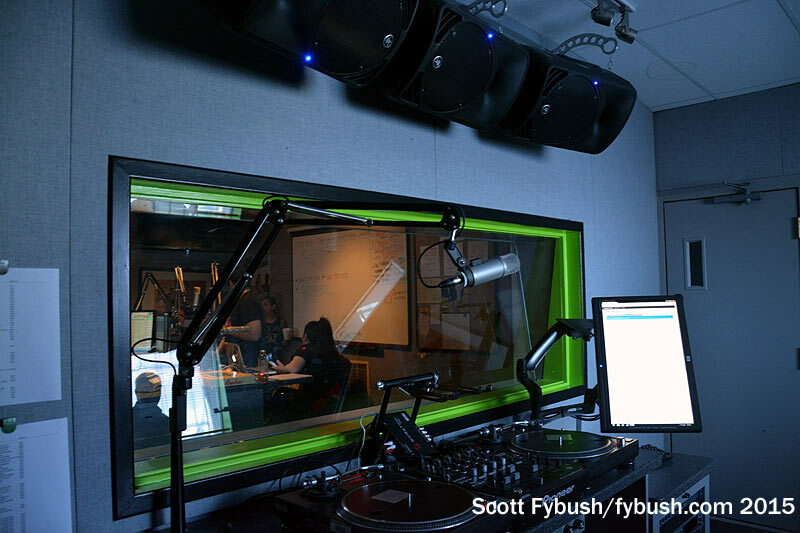 Thanks to Bonneville’s Aaron Farnham, CBS Radio’s Eric Schechter and Sierra H’s Michael Mallace for the tours! And don’t miss a big batch of Arizona IDs next Wednesday, over at our sister site, TopHour.com!